When I heard that a population explosion of koa moths was defoliating thousands of acres of koa forests on Hawaiʻi Island I had to see for myself. 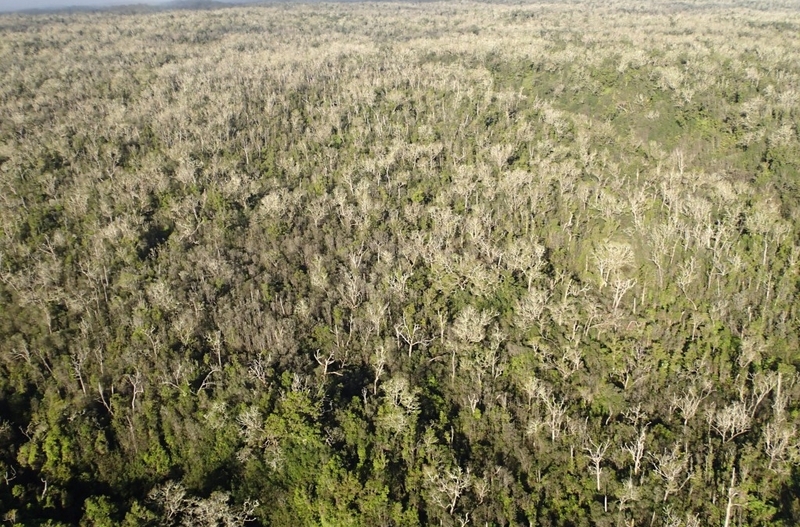 The Department of Land and Natural Resources announced on February 14, 2013 that an outbreak of koa looper moths was stripping koa forests of their greenery on Hawaiʻi Island. University of Hawaiʻi Entomologist William Haines reported that this koa moth infestation is by far the largest on record. 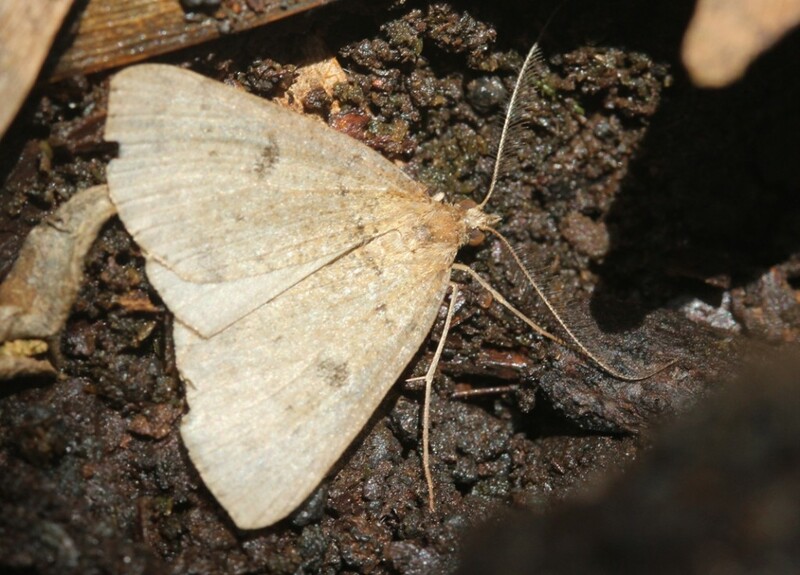 Koa looper moths (Scotorythra paludicola) are endemic to the Hawaiian Islands. 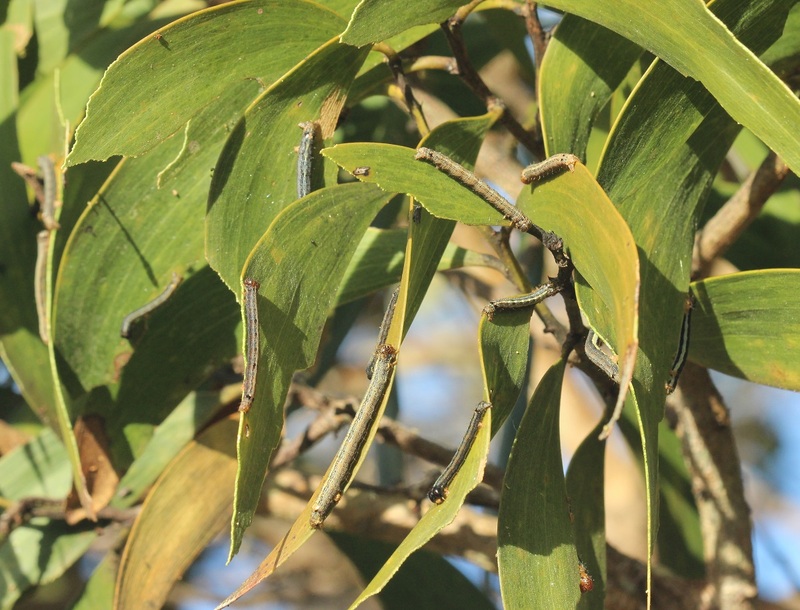 For the most part the moths live in balance with their predators and host tree — the koa tree (Acacia koa). But every once in a while, for reasons not well understood, the population of moths explodes. Haines’ publication recounts 12 previous documented outbreaks of koa moths going back to 1892. In the past 25 years, koa moth outbreaks have occurred on Maui every 5 to 10 years, the last one happening in 2009. 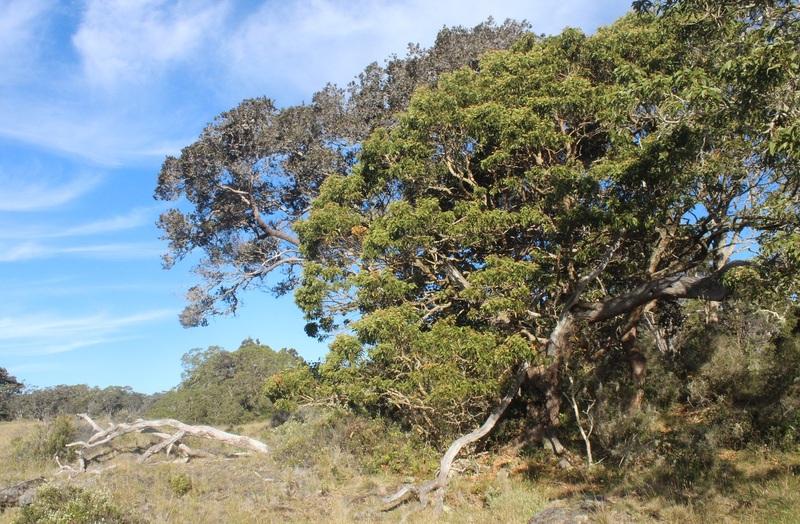 But on Hawaiʻi Island, where the koa trees are larger and koa forests are bigger, the last outbreak occurred in the 1953. 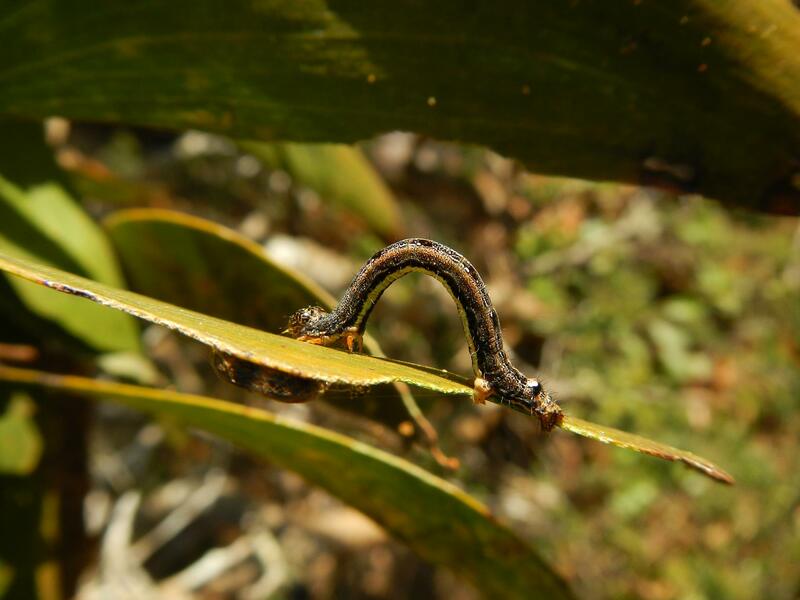 This current population explosion of koa moths on Hawaiʻi Island dwarfs all previously documented outbreaks in size. 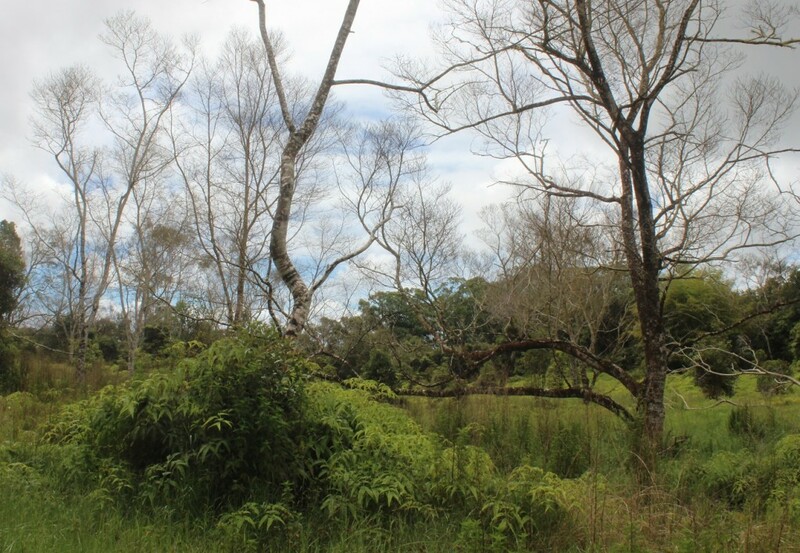 As of June 18, 2013, it was estimated that 50,000 acres of koa trees have been defoliated and outbreak is still growing. My Big Island hiking buddy — Pete Morton — took me to Kaiwiki, just north of Hilo mauka of Honoliʻi on June 8, 2013, to the spot where he saw clouds of koa moths just a week before. As we hiked to a mountain pool we saw several koa moths here and there, but no large numbers — certainly nothing approaching a cloud. 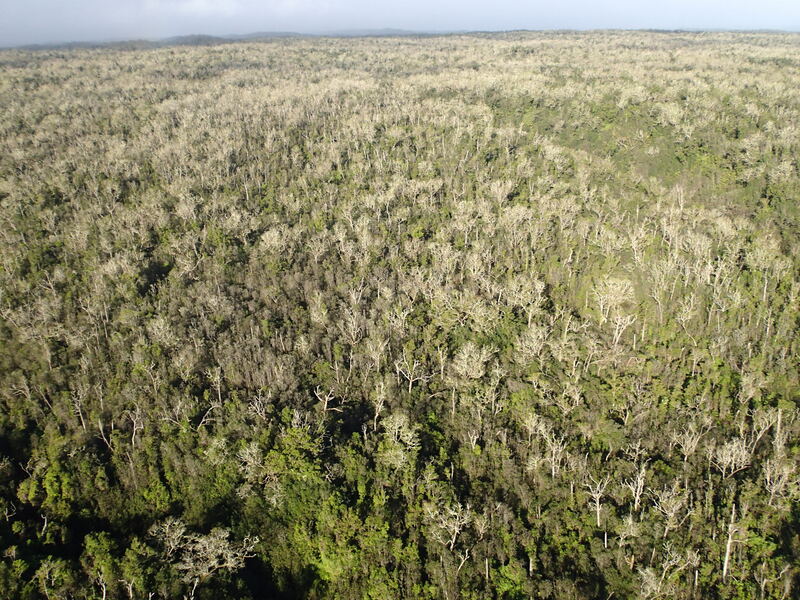 Most of the koa trees in the area — but not all — were stripped of greenery with branches reduced to sticks denuded of vegetation. 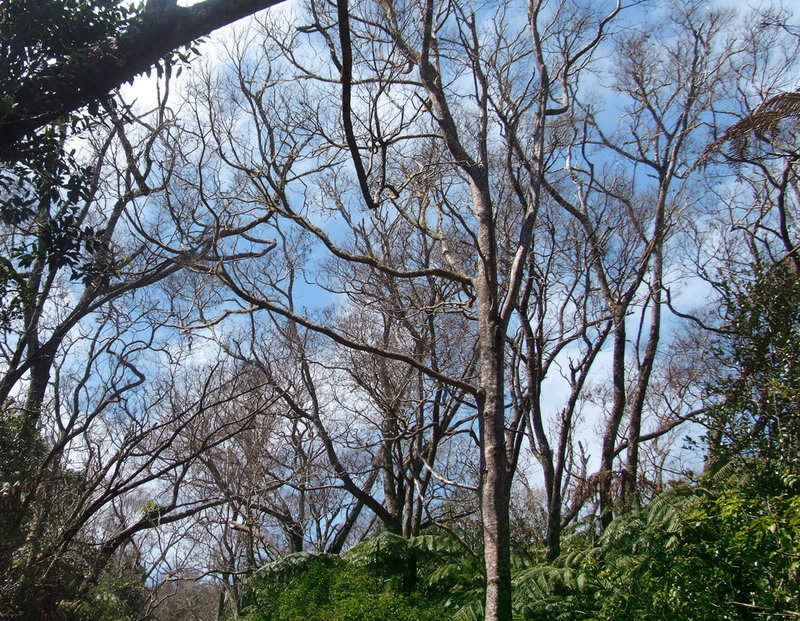 Two days later on June 10, while hiking at Puʻu Makaʻala, we came upon a defoliated koa forest with hapuʻu ferns (Cibotium glauca) in the understory. 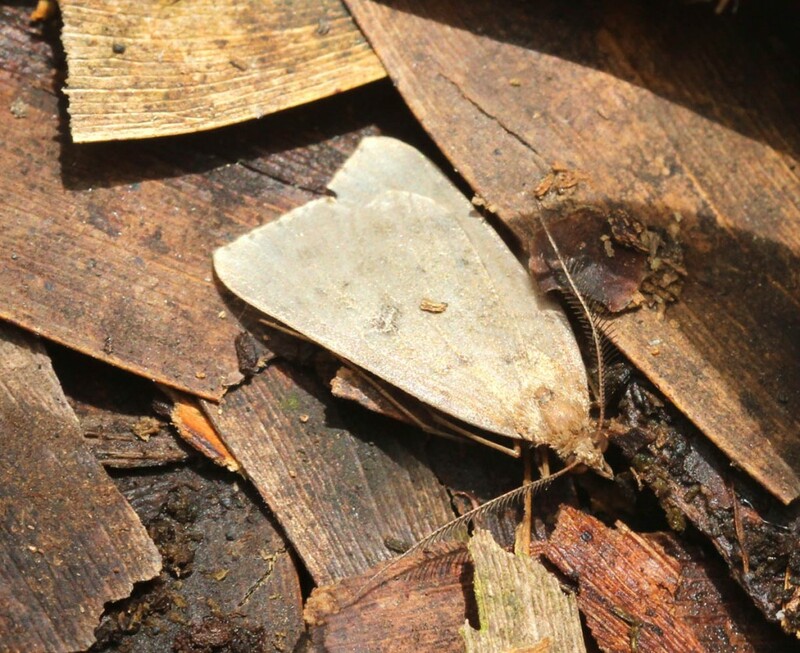 Dozens of koa moths were near or at the end of their lives — some were dead or dying on the ground. The wingspan of the adult koa moth is about 1-1/2 to 2 inches long and varies in color from pale to dark brown with small dark dots or crescents on each wing. 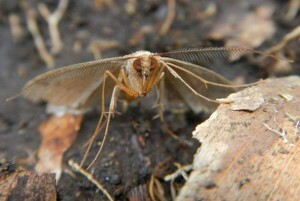 Koa moths have long feathery antennae which you can see more easily by enlarging the photo. When we stirred up the forest floor and shook the ferns, hundreds of moths took the air in a mini-swarm. Take a look at the video at the end of this post to see mini swarms of flying koa moths. The next day on June 12 we hiked the Puʻu Oʻo Trail off the Saddle Road to look for native forest birds and insects. When we came to the first large koa tree in the kipuka, we stopped to get a closer look. 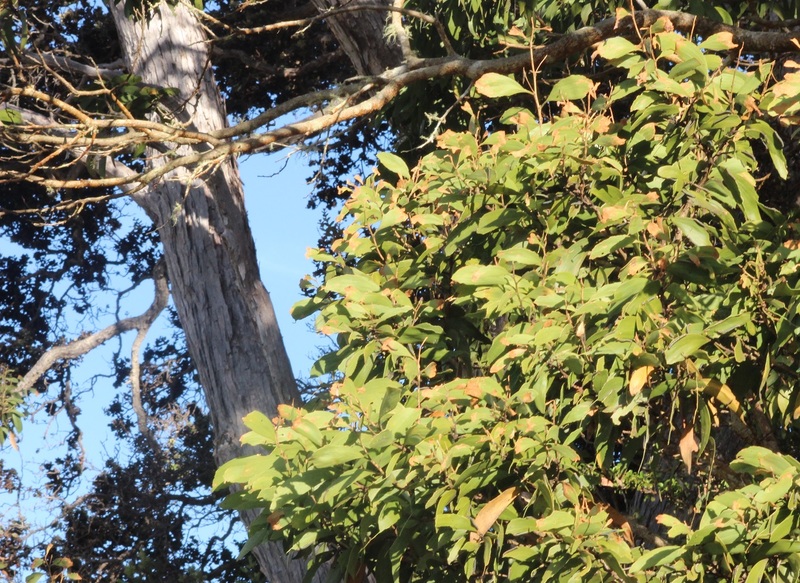 The foliage of the 35 foot tall koa tree was discolored with yellow and brown patches. Thousands of caterpillars were on each tree munching on the foliage and dangling from silk threads suspended from branches higher up. 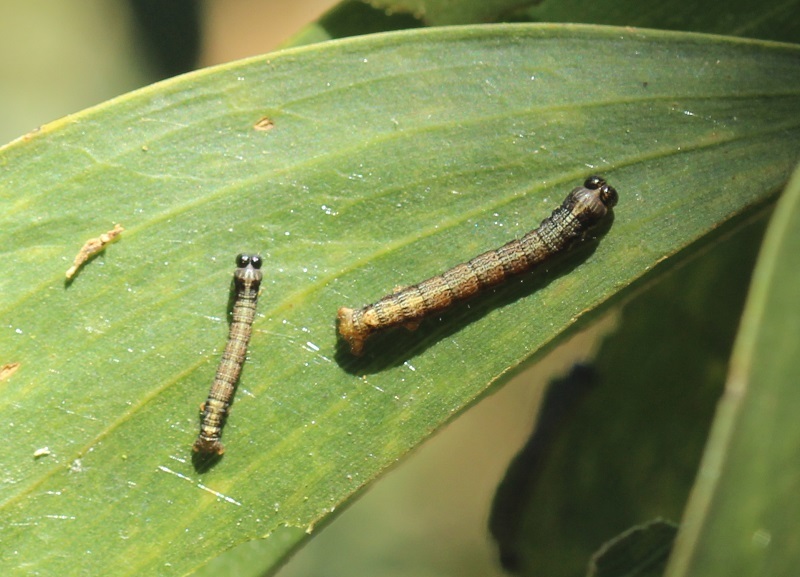 The caterpillars are voracious eaters and devour the koa forests by the millions. 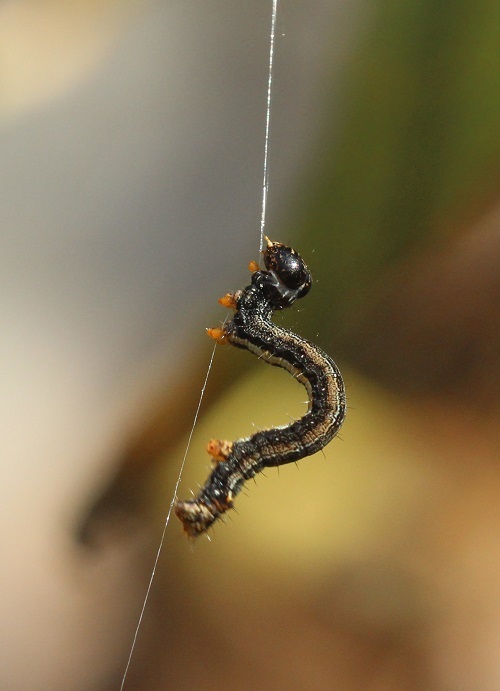 Haines reports that the caterpillar infestation was so great at Puu Waawaa, that caterpillars were just dripping off the trees. Drivers have described “blizzards of moths crossing the Saddle Road”. Many koa trees have lost all of their foliage. 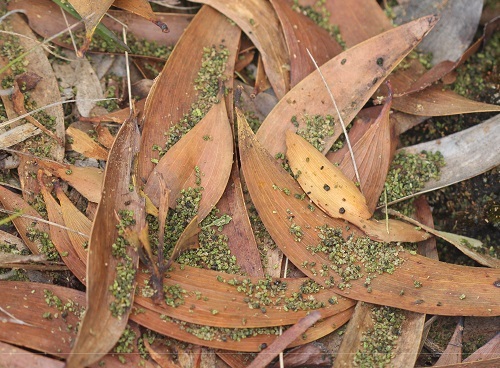 When we looked under the tree on the ground, caterpillar droppings covered the leaf litter and we could actually hear the pitter patter sound of thousands of caterpillar droppings hitting the leaves on the forest floor. Most of the caterpillars we saw ranged in size from 1 to 2 inches long and left silk threads behind where ever they went. The tree is covered with caterpillars and silk threads which the caterpillars use to climb to other parts of the tree. 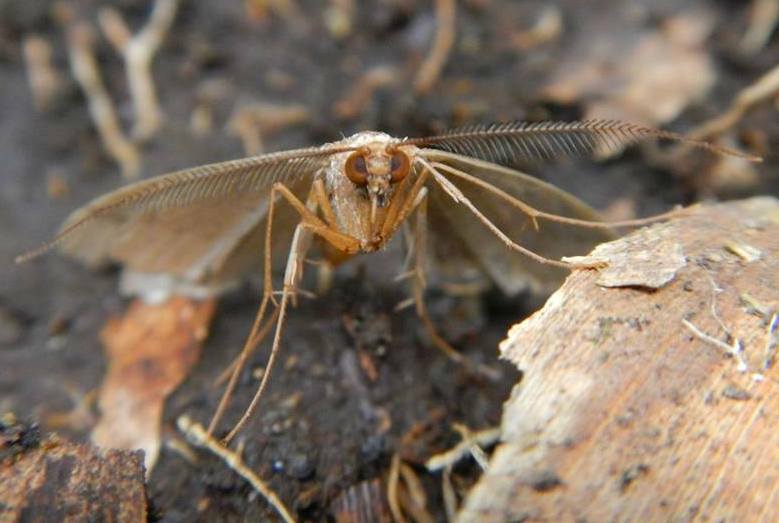 Haines states that despite historical outbreaks of koa moths, little is known about the life history of the moth, duration of life cycle, or their interactions with predators and host. So the environmental triggers for these population explosions are unknown. Outbreaks do not appear to be periodic or cyclical. They have been reported at various intervals during the last 100 years and do not usually occur simultaneously on more than one island at the same time. 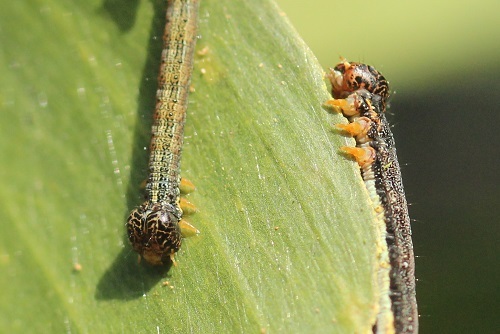 Koa moth caterpillar on the top-side of the leaf with the pupal stage of a wasp (Hyposoter sp.) on the underside. When the wasp emerges it mates and lays eggs on the caterpillars which parasitize them. One of the things I hoped to see was a feeding frenzy of native birds feasting on caterpillars but unfortunately, I did not see any insectivores taking advantage of the bounty. My observations were limited to what I saw over 9 days at various locations on the island and are unlikely to be representative of what is really happening. 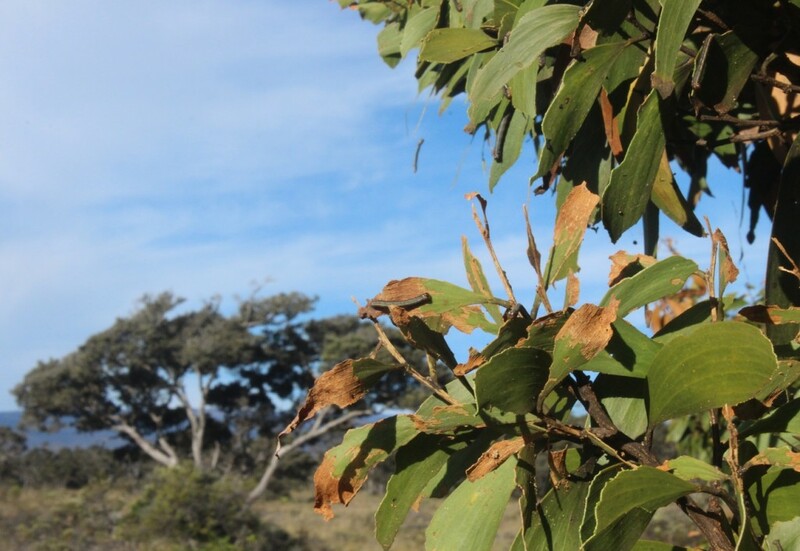 Healthy koa trees whose foliage has been devoured are expected to recover but trees that were diseased, sickly or otherwise not doing well to begin with could be dealt their final blow. Native birds and insects whose life cycles are tied to the koa tree are expected to be impacted in the weeks, months, and even years to come. What will ultimately cause this current population explosion of koa moths to end is not known. Moth numbers could potentially be brought under control by predators, parasites, or diseases, or they may simply lose momentum as food resources are depleted. It will be interesting to follow this record-breaking outbreak to see how it will end. Yes it will be interesting. I will be around for another 10 years, I hope they can keep funding to continue the study. Thanks Nate. WHO KNEW NATE, THX 4 DA INSIGHT & GREAT PICS & U BUDDY, “KEEP ON TRUCKING” !! Thanks for the informative update and the pictures. Has anyone seen evidence of moth problems on O’ahu Koa? Nope… the koa moth outbreak is limited to Hawaii Island. Mahalo for the pictures and information. I will share with my students at Kamehameha who are in the Koa team.